Posted on September 30, 2013 by Becka O. Even if you think this book will be, as my friend put it, “another one of those depressing books about kids dealing with bullies in school,” or have something against 5th graders– read it. Everyone must read it. I swear, if you read this book, you will never, ever in your life, look at someone with a facial deformity, wince, and look away. Another good book to read that is more depressing is called Out Of My Mind. I would check Wonder out of the library immediately (I have it checked out right now at my school library). 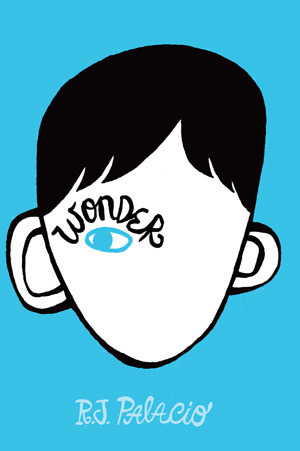 Wonder will change your whole life. This entry was posted in Book Reviews and tagged book review, contemporary, r.j. palacio, realistic by Becka O.. Bookmark the permalink. I was actually at the book store the other day when I picked this up and started to read it. Unfortunately I wasn’t able to purchase it, or pick it up at the library later (yet), but I think I will now go and pick up the book to read after reading your review. Thank you for re-sparking my interest! Your review is very well written and argues the point well, that it is a book that will change your life after reading!